1.Preheat oven to 350°. In large skillet, cook bacon over medium heat 5 minutes. Add bell pepper, onion and mushrooms; cook 5 minutes. Remove skillet from heat and stir in spinach. In medium bowl, whisk together egg whites, eggs and pepper. 2.Spray 8 standard muffin cups with nonstick cooking spray. Evenly divide bacon mixture into prepared muffin cups; sprinkle 1 teaspoon cheese over bacon mixture. 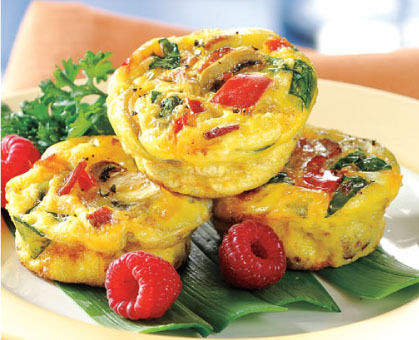 Evenly pour egg mixture over cheese in muffin cups. 3.Bake quiches 20 to 25 minutes or until tops are lightly browned and internal temperature reaches 145°. Cool in pan 5 minutes, then invert quiches onto plate. > Baked quiches can be tightly wrapped and frozen for up to 2 months.